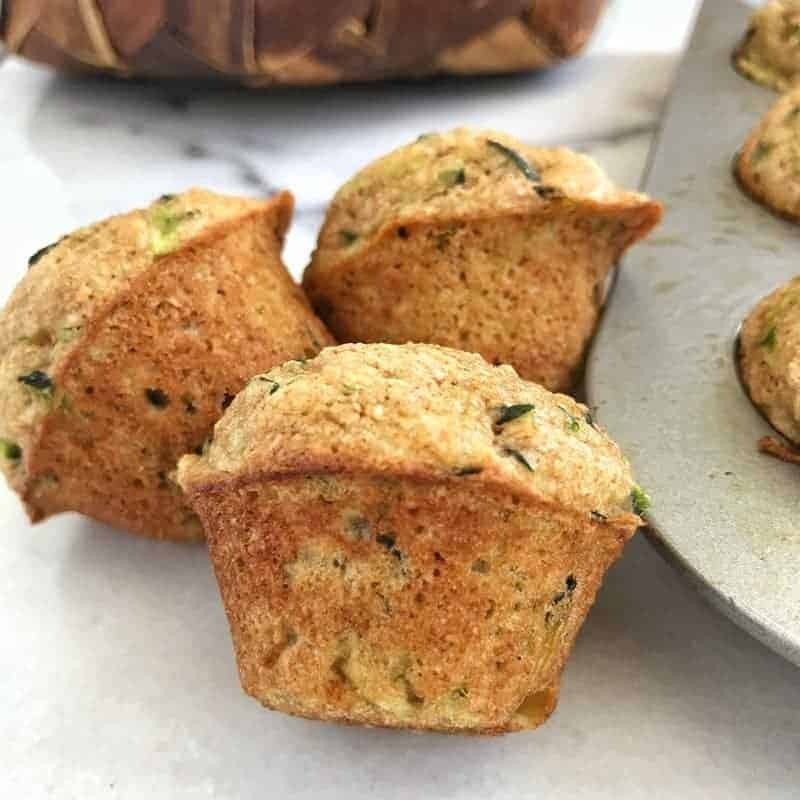 These Mini Zucchini Muffins are the perfect after-school snack. Quick to make and easy to freeze for grab and go snacks. 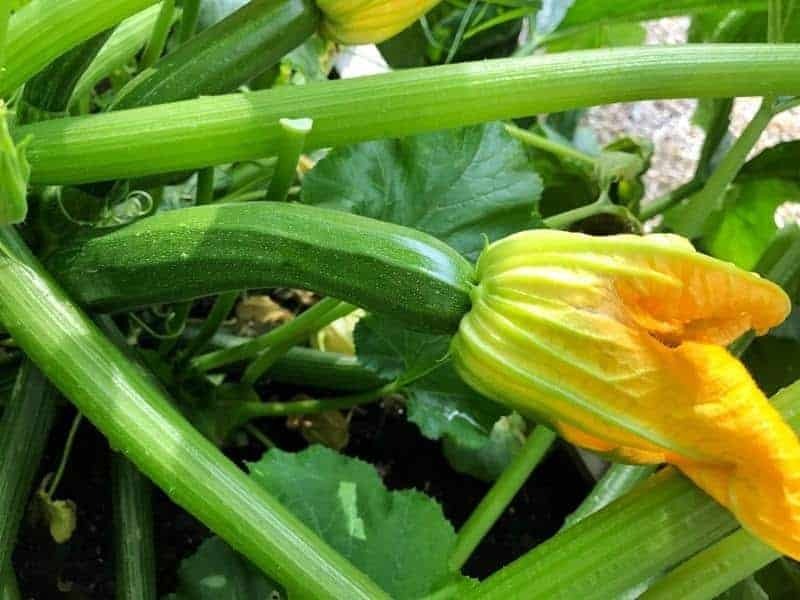 In the summer months, zucchini grows like a weed in my garden. It is beat only by green beans. You can read about my gardening tales here. There is just one small problem with having all this zucchini. I struggle to get my family to eat it. Baked, sautéed or roasted it doesn’t seem to matter. However, I have found one way to get them to eat it – baked in muffins. That means at this time of the year I am making a lot of zucchini muffins! That’s ok though because they freeze great and are the perfect grab and go snack. When I don’t have time to be baking, I simply shred the zucchini and freeze it measured out for later use. While my family doesn’t love zucchini…yet… I do. My favorite way to eat this easy to grow veggie? Sliced raw and dipped in hummus. If you’ve never tried zucchini raw, I highly recommend you give it a try! What exactly is zucchini? Zucchini is classified as a summer squash, which are squashes that are harvested before their rinds harden (such as pumpkins and acorn squash). Zucchini’s come in green, yellow, and speckled colors. They are often mistaken for yellow squash, which is a different vegetable. The easiest way to tell the difference is to look at the shape. Zucchinis of any variety look like a cylinder from end to end whereas yellow squash usually has a tapered neck, either straight or crooked. While zucchini is served as a vegetable, it’s actually a fruit because it comes from a flower. 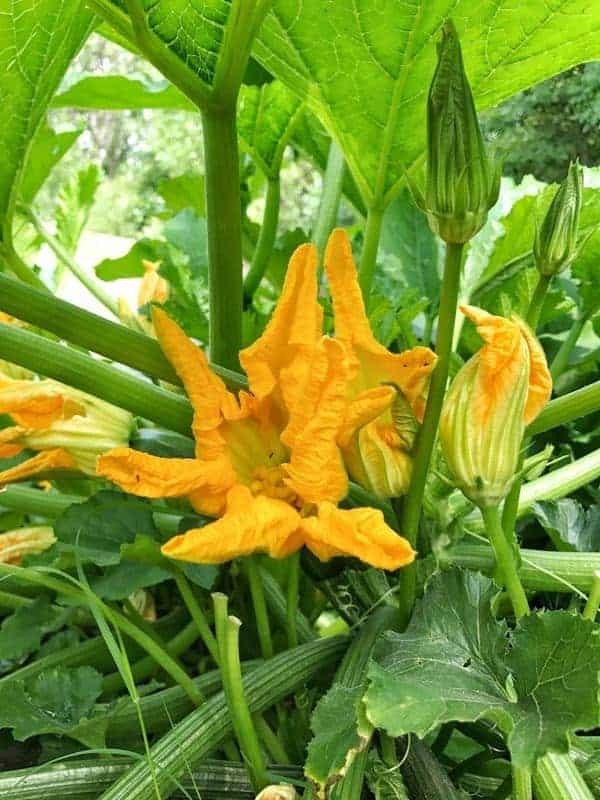 Zucchini flower blossoms are edible and are typically served fried or stuffed. The world’s largest zucchini on record was 69 1/2 inches long and weighed 65 lbs. Bernard Lavery of Plymouth Devon, UK, grew the large veggie. However, biggest is not best in the case of the zucchini. The tastiest zucchinis are small to medium-sized. Zucchini is low in calories and is packed with potassium, it has more potassium than a banana. 1 medium zucchini has over 50% of your daily vitamin C needs! Much of the antioxidant content is found in the zucchini’s skin. Make sure to keep the skin on when preparing this veggie! Zucchinis can be eaten raw as a dipping veggie, roasted, grilled, sautéed, broiled, or steamed. They can also be shredded and frozen for later use. This healthy snack for kids is perfect for both snack time or lunch boxes. Watch to see how easy this healthy snack for kids is to make in the video below. It’s so delicious no one will ever know it’s made with a veggie! 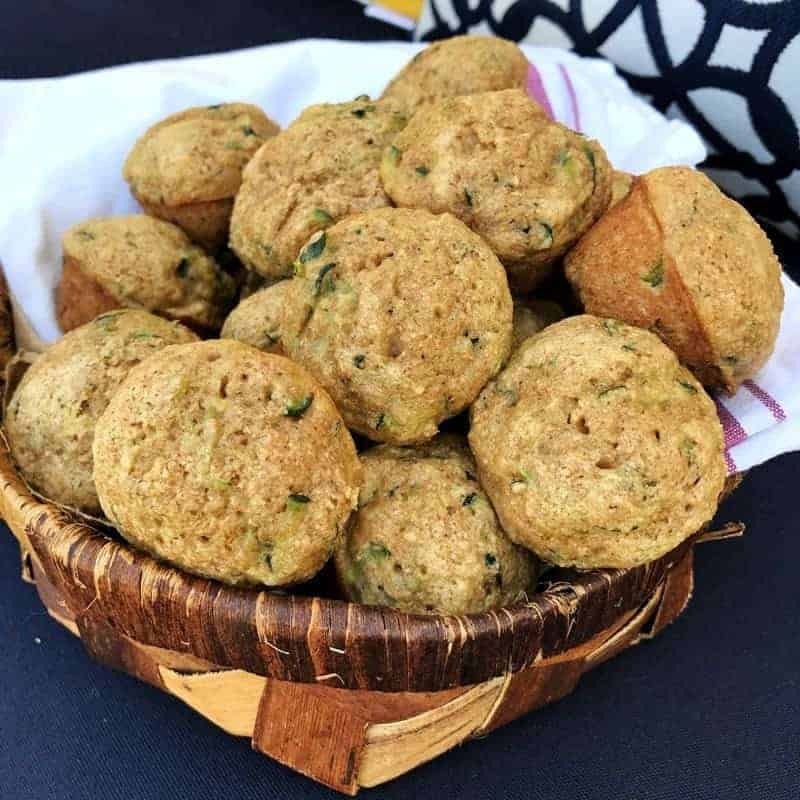 These muffins are also a great way to introduce your family to whole grains, as it uses all whole-wheat flour. TIP: When using all whole wheat flour, let your batter sit 15-30 minutes before baking. This results in a more moist product. Mini Zucchini Muffins are the perfect after school snack. Made with whole wheat flour, they are a healthy snack for kids any time of the day. Prepare mini muffin tins with non-stick cooking spray. Mix eggs, applesauce, granulated sugar, brown sugar, and vanilla together in large bowl. Blend flour, baking soda, baking powder, and salt in a medium-sized bowl. Scoop batter into prepared pans. A one-ounce scoop works well. Wait a few minutes, then remove muffins from pan and cool on cooling rack. Place a couple muffins in a ziplock bag for quick snacks on the go or try freezing them for later. You can substitute 2 cups sugar for the honey and maple syrup if desired. You may also use half white/ half wheat flour. Check out more Healthy Snack Ideas HERE! I liked this…i added a small amount of dried cranberrys and a few pecan pieces…I might use more cinnamon next time and I used 1/2 and 1/2 white and wheat flour. I always used 1/2 honey and 1/2 agave… GREAT with no sugar! I love your additions! I am going to try dried cranberries next time! 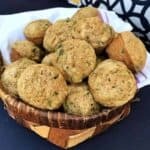 This is my go-to recipe for zucchini muffins!